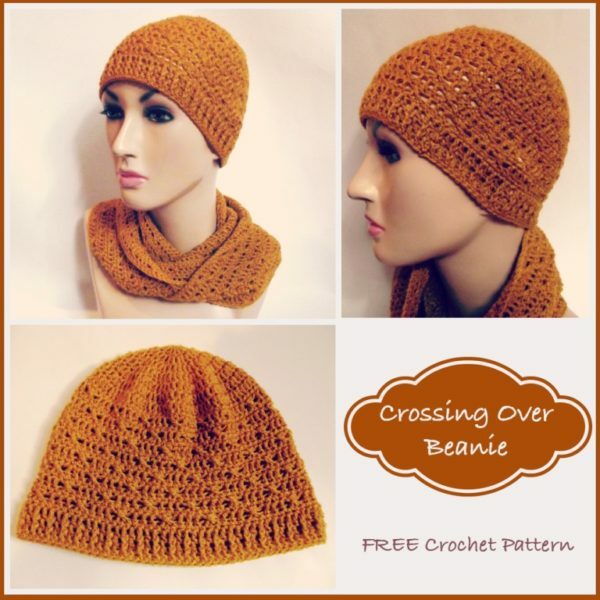 The name for this crossing over beanie crochet pattern came as a result of the cross stitches used … and also because I’m always crossing over new bridges in my life. Some bridges are fun to cross, while others are not so fun. Sometimes they are wobbly and give you the creeps as you are crossing over. Other times they run through dark tunnels; tunnels so dark that you can’t even see your own steps. And you have no idea if there’s a light at the other end, or if you’ll even make it that far. But you keep going anyway because you don’t have the option of turning back. Then after a while, you begin to see a tiny light at the end of the tunnel and you start moving faster. And once in a while you look back to see how far you’ve come, and you begin to see the beauty of that tunneled or wobbly bridge. You begin to realize that it has given you a new strength, a new knowledge and the courage to face your deepest fears. It has given you all the tools needed to face what’s in front of you. And you wouldn’t trade those tools in for the world. I don’t know who you are, or where you are, or what cards you have been given to play with. But I’m 99.9% certain that you know exactly what type of bridge I’m talking about. And therefore, I dedicate this beanie pattern to you, and to all those who have crossed any type of bridge in their lifetime that wasn’t so pleasant. This beanie can be crocheted to any size by increasing or decreasing the diameter. I used a fine yarn, so it has a lot of stretch in it, but if you don’t like crocheting with fine yarns, you might be able to crochet it with a regular yarn. I can’t guarantee the outcome, but I don’t see why it wouldn’t work. Just make sure you adjust the diameter to your size. Hope you will enjoy your new beanie. And here is the cowl pattern to match. Gauge: Measures 2.5″ over first 3 rnds. Finished Size: Measures 9″ across when laying flat. Can be increased or decreased to any size. When you do your front post double crochet (fpdc) stitches at the brim, bring them up as high as the double crochets (dc) stitches in order to prevent the brim from curling up. Rnd 1: Work 12 dc into 3rd ch from hook; join with sl st in first dc. Note: For a larger or smaller hat, simply do more or less of the increase rounds. Then continue with Rnd 8. Rnd 12: Same as rnd 10. Rnds 13-24: Rep rnds 9-12 until you have reached a desired height for the hat. Rnd 28: Ch 1, sc in same st as join and into each st around; join with sl st in first sc. FO. I especially enjoyed the inspirational thought at the beginning of your pattern. It is extremely soothing and gives one that extra “umph” we all need now and then! Thank you so very much!! This is such a pretty pattern and I love the reason for it’s name! Thank you for sharing! Rhelena, I don’t have the words……..You are awesome! I’m not sure how much in a worsted, but I’d say a regular ball of yarn should be enough.